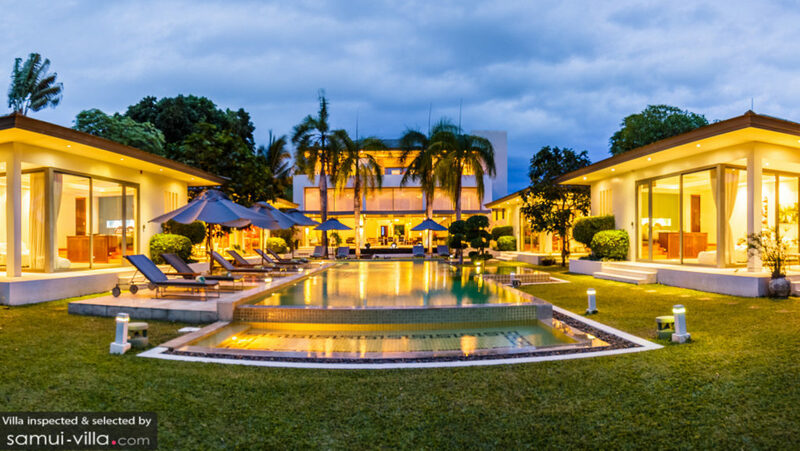 Villa Baan Asan is a massive, ultra-modern luxury villa where family holiday dreams come true. 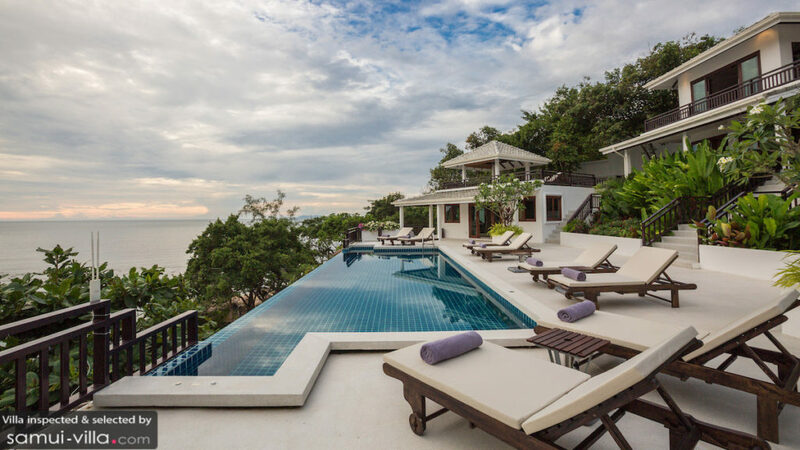 Located right by the sea at Taling Ngam Beach in Koh Samui, the villa has an impressive 20-meter lap pool and a jacuzzi with ocean view. You can spend hours enjoying the refreshing pool or go snorkelling in the crystal clear water. 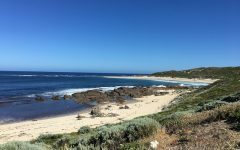 There are indoor and alfresco dining options, there is a private gym, a library room and there are bedrooms with ocean views, too. What about the children? Well, surely the kids will love the 20-meter swimming pool in the garden, a high-tech media room and on top of that, they get to sleep in their own bedroom with bunk beds. Yay! Located just 300m away from Bantai Beach, villa Aperol is a really charming and cosy vacation home with modern comforts and a harmonious design. The villa has 2 bedrooms and is perfectly affordable. The garden is utterly tropical, planted with leafy palm trees all around. In the centre sparkles the Yin Yang private swimming pool with shallow step-in, flanked by 2 orange reclining chairs and a big bright, orange parasol. 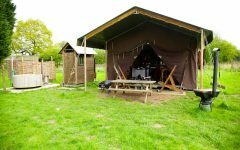 Then, there is the outdoor Sala with seating arrangements, a kitchenette and a BBQ. The living room is equipped with AC and it features a sofa, a TV and kitchen with a bar and high chairs. 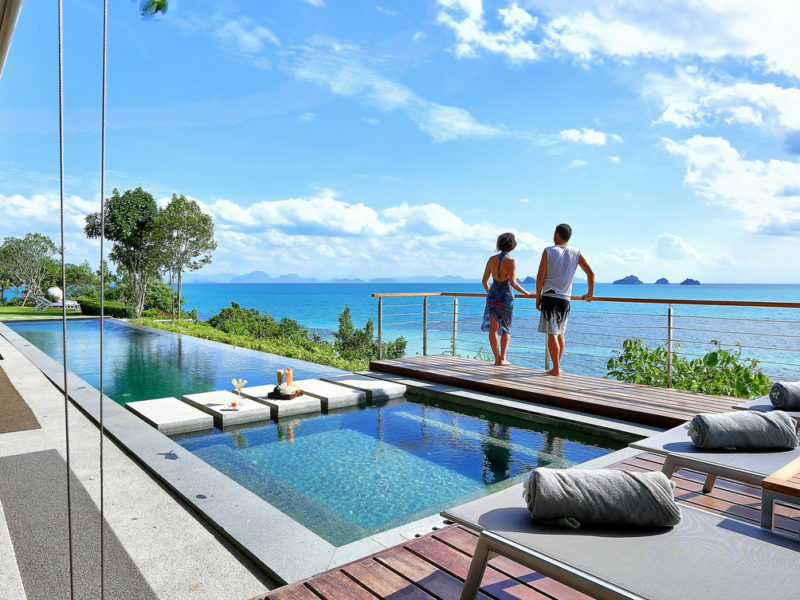 A convenient holiday home on Koh Samui for your family, indeed! The Secret Beach villa is not located on Koh Samui but on the neighbouring island Koh Pha Ngan. 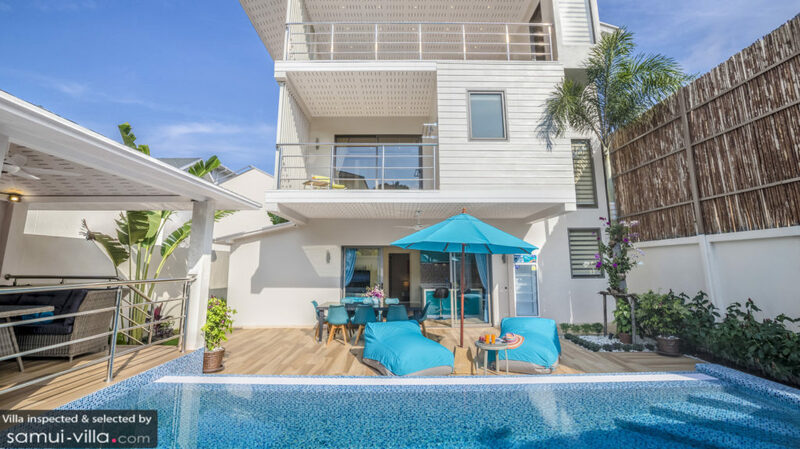 The villa is built on the hillside facing the ocean and it’s got glorious luxury facilities such as an infinity-edge swimming pool, a massage area, gym, a surround sounds media lounge, a billiard table and a kids bedroom with toys and cute fluffy animals. 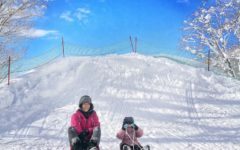 Kids will feel at home straight away while parents are bound to be stunned by the beauty all around. The villa comes with a house chef, spoiling you inside out and there are kayaks available, too, if you feel like heading out to sea for a bit. 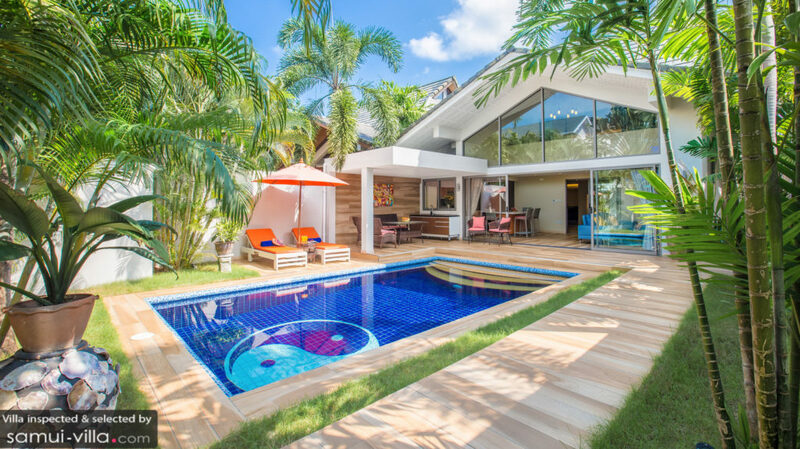 Perfect for big families, Villa Monsoon is found at Bang Po Beach and it features a beautiful view of the bay while it takes just 20 minutes to get to the buzzing town of Chaweng. 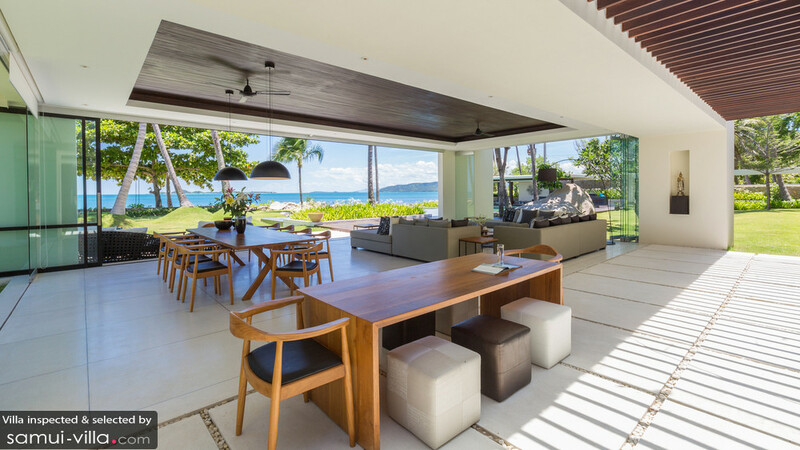 The villa has a contemporary design, featuring double story buildings with breezy terraces and air-conditioned living and dining spaces overlooking the ocean through floor-to-ceiling glass sliding doors. Villa Monsoon features an 18-meter infinity pool, a tennis court, billiard table and a cinema room. For the little ones, there is a children’s playing room and a shallow kids pool. Nothing more you need! Villa Colibri is a very affordable 4-bedroom private pool villa in Koh Samui, great for family getaways near Bang Po Beach. The villa features a modern architectural design and the interior design is ruled by white and light blue colours. By the poolside, there are comfy bean bags to chill out on in the shade of a parasol. There is a covered alfresco dining area and a poolside Sala with a comfy sofa and a pull-down projector screen to watch movies in the open-air. Villa Colibri also features an air-conditioned living room with all modern comforts and a rooftop yoga terrace with ocean views. 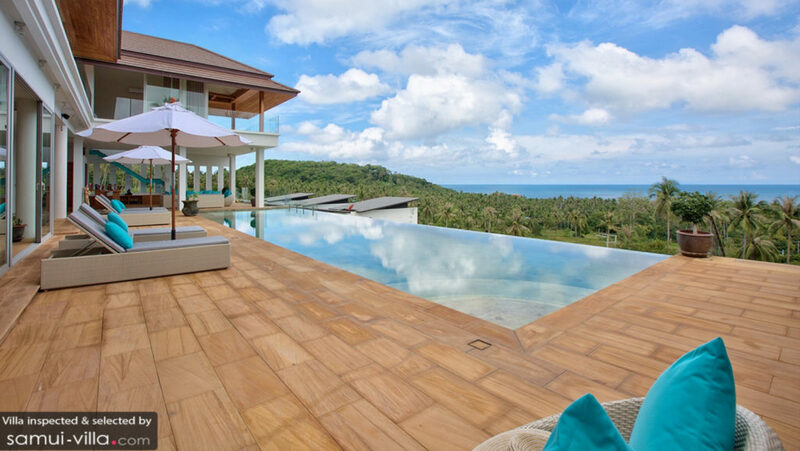 The View Villa is an amazingly luxurious beachfront holiday haven, designed for large families wanting to soak away in luxury this holiday to Koh Samui. The infinity swimming pool, as well as the jacuzzi, boast mesmerizing ocean views and there is a massive green grass lawn for the kids to run around on and for those alfresco dinner, cocktail and BBQ parties. The living room features a pull-down projector screen converting the space into a splendid cinema lounge at the tip of your finger (in fact, there are 3 pull-down screens across the property). There is a massage terrace where you can get pampered to the sound of the sea, there is a private gym and there is a bunk-bedded kids bedroom, sleeping up to 6 children in total. Amazing! 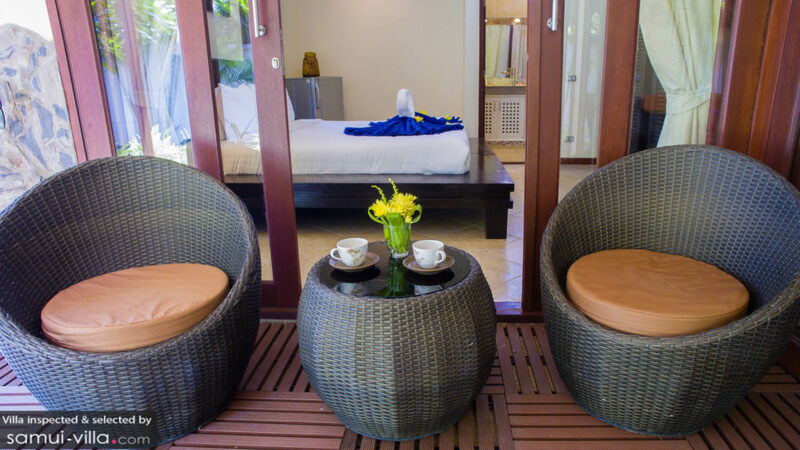 This villa is located near Choeng Mon beach and is a real homey family retreat that comes at a very affordable price. Villa Swiss Garden features a wonderfully spacious garden where kids can run around freely if not spending all of their time in the swimming pool. Actually, the villa features 2 swimming pools; the main pool overflows to a shallow kiddies pool. How perfect! Reclining chairs are placed by the poolside and there are several options to sit and have drinks or enjoy a meal alfresco style. Then, there is the living room, equipped with AC and it’s got everything a family home needs: a sofa TV corner, dining table and a spacious family kitchen. 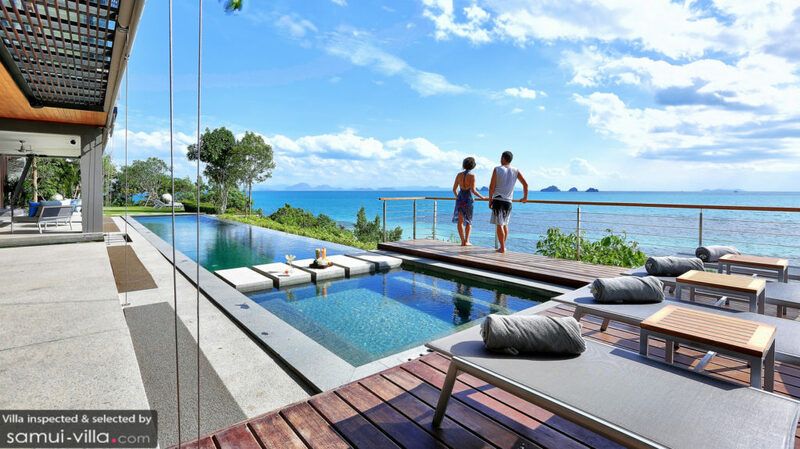 Villa Malabar is a high-end, ultra-modern, absolute ocean-front luxury villa in the south of Koh Samui. This massive luxury retreat houses no less than 7 bedrooms, perfect for big family getaways and special events. The sparkling private infinity pool has a shallow area for the little ones to splash around and it boasts a sunken sofa lounge to gaze at the amazingly beautiful island sunset in the afternoon. Villa Malabar has a private gym and a very spacious living room designed with full-length glass bi-fold doors to maximize the sea views. There is a separate air-conditioned cinema lounge. While moms and dads sleep in decadent ocean view villa suites, the kids will adore their bunk room where they can have pyjama parties and sleep all together in one room.